All external walls require insulation, and brick is no exception. Consolidated Energy provides a range of efficient brick cavity insulating products for residential and commercial developments. Insulation of cavity brick walls is always best done when the house is being built, but we do have a range of solutions for retro-insulating older homes. Double brick houses have a reputation in Australia for being hot in summer and cold in winter. The thermal rating (R-Value) of a double brick wall (RO.50) is about the same as an uninsulated brick veneer (RO.46) and uninsulated weatherboard (0.46). A building of heavy material such brick responds slower than buildings of lighter material (ie timber) to fluctuations in outside temperatures. This is known as ‘thermal lag’. This slow thermal lag can make a brick house appear better insulated than some other materials, but when the house gets hot, it has a tendency to stay hot longer (or cold longer in winter). DriTherm® Cavity Wall Insulation is rigid slabs of non-combustible, glass mineral wool with a water-repellent additive. Odourless, rot proof, non-hygroscopic, do not sustain vermin and will not encourage the growth of fungi, mould or bacteria. Virtually no vapour resistance, allowing water vapour to pass freely through the slab and therefore allowing wall to breathe. Easy to handle and install, being lightweight and easily cut to size. Contains a water repellent silicone binder to ensure no water passes through to reach the inner leaf of masonry. Nor will it transmit moisture by capillary action across the cavity. Free from CFCs, HCFCs and any other material with ozone depletion potential in its manufacture and content and represents no known threat to the environment. Supafil® Masonry Cavity Wall Insulation is a silicone treated, non-combustible glasswool for injection in either existing masonry walls or the walls of new homes. It is ideal to increase the energy efficiency in older homes for which it is impossible to install batts. It will be available through AGI in early 2015. In the United Kingdom, Blow-in has been installed in over 5 million existing homes to increase energy efficiency and bring the comfort levels up to modern standards. Polyair’s range of high performance reflective insulation blankets deliver high R-Values and an easy to install and cost effective insulation material for cavity walls. Polyair Performa 4 and Performa 7 combine an inner core of fire retardant closed cell foam with two external layers of high performance reflective aluminium foils and a special external coating of gold coloured antiglare with reinforced netting. Both external surfaces reflect radiant heat and the fire retardant inner core achieves thermal break (Performa 7: R0.2 and Performa 4: R0.1) and prevents heat flow transferring from one surface to the next. Polyair’s high thermal performance against heat flow provides an excellent energy efficient solution that’s safe, easy to install and cost effective. Polyair excels in laboratory testing for all mandatory Australian Standards, National Construction Code and Building Code of Australia certification benchmarks. 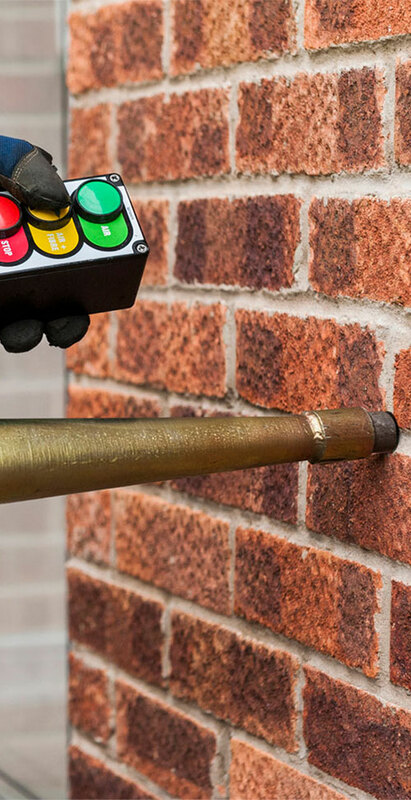 Cavity wall insulation can be installed in most double brick homes during or after construction to greatly increase energy efficiency and reduce space heating costs. The insulation material creates thermal mass within the walls to prevent heat transfer through convection, keeping households cooler in summer and warmer in winter. Access to install cavity insulation into the external walls of an existing home is usually obtained by removing roof tiles. For houses with a metal roof, access can obtained by either lifting the roof sheets or injecting the insulation material through holes drilled in the external skin of brickwork. As a cost-effective and environmentally sustainable product made from 100% recycled material, every double brick home owner should consider the benefits of cavity wall insulation.